John Paintsil has been included in Ghana's squad for the Africa Cup of Nations qualifier against Malawi. The match, in Lilongwe on 13 October, will see the Black Stars trying to protect a 2-0 advantage. Defender Paintsil has not been seen in a Ghana jersey since this year's Nations Cup finals co-hosted by Gabon and Equatorial Guinea. The 31-year-old's recall follows his recent move to Israeli side Hapoel Tel Aviv after a long spell of inactivity. 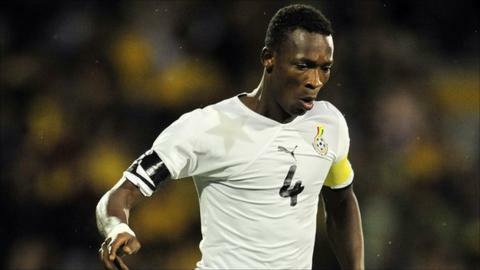 Paintsil is one of five players handed international lifelines by coach Kwesi Appiah. The others returning to the national team are France-based pair Jonathan Mensah and Rabiu Mohammed, David Addy of Portuguese side Victoria Guimeras, and Accra Hearts of Oak goalkeeper Philemon McCarthy, who is back after a six-year absence. Appiah also included Espanyol midfielder Wakaso Mubarak and local player Daniel Nii Adjei in the national squad for the first time. Adjei, who plays for Asante Kotoko, was voted the most outstanding player in Ghana's Premier League last season. But while Paintsil and Mensah have been handed tickets back to international football, Appiah has wielded the axe on a number of big names too. Veteran midfielder Derek Boateng is the biggest casualty. Also missing from the squad are right-backs Daniel Opare and Samuel Inkoom, as well as Olympique Marseille striker Jordan Ayew. Ghana, semi-finalists in the last three Nations Cups, are seeking to qualify for their fifth straight tournament. The Black Stars will prepare for their clash with the Flames in the Kenyan capital, Nairobi. Defenders: John Paintsil (Hapoel Tel Aviv, Israel), Harrison Afful (Esperance, Tunisia), David Addy (Vitoria Guimaraes, Portugal), John Boye (Rennes, France), Isaac Vorsah (Red Bull Salzburg, Austria), Jonathan Mensah (Evian Thonon Gaillard, France). Strikers: Emmanuel Clottey (Esperance, Tunisia), Abdul Majeed Warris (Hacken, Sweden), Asamoah Gyan (Al Ain, UAE).